The EUR/USD’s trading right around where we left it on Friday. The currency pair found strength once again just around our 2nd uptrend line, setting a slightly higher low than Thursday. However, downward forces remain since last week’s global econ data ended on a sour note. German Retail Sales printed 12 basis points lower than analyst expectations, negating Thursday’s positive Employment Change number. Furthermore, investors found that U.S. prices and personal spending continue to decline while Unemployment Claims remain at historically high levels. Therefore, unemployment and consumption are lagging behind the improvement in corporate earnings. Investors should keep in mind that much of the rebound in earnings has been driven by a combination of deep cost cutting measures and global economic stimulus measures. Hence, economists are becoming increasingly worried that any premature removal of stimulus and tightening of liquidity may jeapordize the global recovery taking root, resulting in additional cost cutting and even higher unemployment. As a result, investor uncertainty is rising, as seen by the large pop in the VIX, and are divesting from risk and heading towards the Dollar. The EU will be relatively quiet data wise until Thursday’s monetary policy decision. The ECB was complaining about the strength of the Dollar recently, and the Euro has since declined about 300 basis points. As a result, the ECB may be less inclined to take any liquidity measures at this week’s meeting. Although, we will have to see how the Fed acts on Wednesday first. Therefore, between now and then activity in the EUR/USD will likely focus on U.S. econ data and Q3 earnings reports. Hence, investors should keep an eye on the S&P futures and their interaction with present technicals along with October lows should they be tested. Technically speaking, last week’s sharp movement below the psychological 1.50 level is a discouraging sign for bulls. However, there remain several uptrend lines we can form, meaning the EUR/USD has a few technical cushions to rely upon before investors can safely cry bear. The EUR/USD has three uptrend lines to fall back on along with the psychological 1.45 level should the currency pair take a turn for the worst. Our 2nd tier uptrend line seems to be a key technical since it runs through October lows and likely represents the support separating the EUR/USD from a retracement towards 1.45. 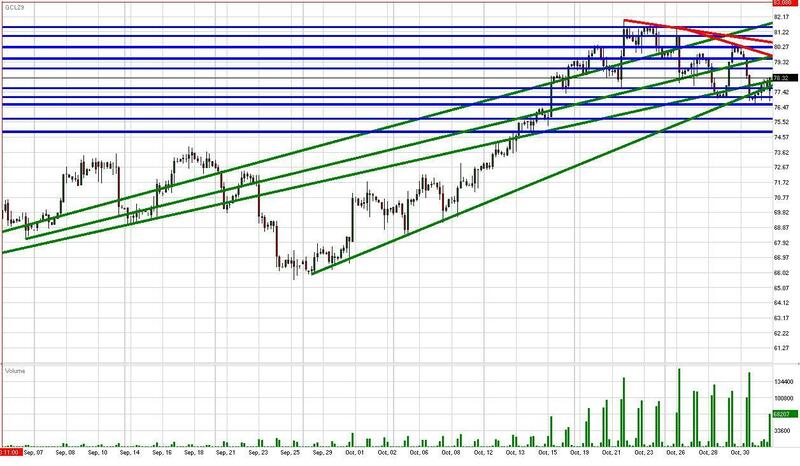 As for the topside, the EUR/USD now has multiple uptrend lines bearing down on price and the psychological 1.50 level becomes a technical barrier once again. Overall, although the uptrend remains intact, investors should tread carefully since U.S. equities are facing headwinds. The Cable is tacking onto Friday’s selloff backed by a pop in sell-side volume. Friday’s weakness came on the heels of worse than expected British HPI data along with disappointing U.S. pricing and spending numbers. The EUR/GBP has been hit heavily recently, making today’s pop in the currency pair and present relative weakness in the Pound warranted. The Cable is adding onto its losses today after a Bloomberg report signaled that many analysts expect the BoE to increase its QE package by 50 billion at its upcoming monetary policy meeting. Britain’s recent negative Prelim GDP number sent shockwaves throughout the FX market, and analysts are expecting the BoE to react by loosening liquidity further. However, investors should keep in mind that we have seen some encouraging data from Britain lately, including today’s impressive Manufacturing PMI number. Hence, positive results from tomorrow’s Halifax HPI and Wednesday’s Services PMI data points could change the present bearish tone. The Services PMI number should carry the most weight of the two releases since services comprise roughly 70% of Britain’ GDP. The last release thoroughly trounced expectations, and analysts are expecting the indicator to remain around a respectable 55.4 level. Meanwhile, the riskier investment vehicles sure could use a little boost from econ data since we are witnessing a flight to safety across the board. The S&P futures received large sell-side volume with Friday’s sizable pullback beneath Wednesday lows. Hence, there remains a downward pressure on U.S. equities, meaning investors could continue to favor the Dollar since the Greenback and equities are normally negatively correlated. Therefore, investors should keep an eye on the S&P’s reaction to upcoming econ data and Q3 earnings, particularly if we should witness a retest of October lows. The Cable should ultimately follow its positive correlation with U.S. equities despite its relative strength as of late, that is unless the BoE behaves surprisingly hawkish at this week’s policy meeting. Overall, with key econ data and an abundance of monetary policy meetings we should be in for another volatile trading week. Technically speaking, the Cable still has a couple uptrends to fall back on along with 10/28 and 10/26 lows. However, the currency pair is getting awfully close to our 2nd tier uptrend line, which may separate the GBP/USD from stabilization and a retest of the psychological 1.60 level. As for the topside, the Cable has multiple downtrend lines bearing overhead along with 10/20 and 10/30 highs. Additionally, the psychological 1.65 level serves as a technical barrier once again. Friday’s selloff in the USD/JPY accelerated on large volume as investors headed divested from riskier investment vehicles in reaction to the large selloff in U.S. equities. Friday’s strength in the Yen also stemmed from the BoJ’s decision to end a couple of its bond purchasing programs in an effort to tighten liquidity. Friday’s monetary policy falls in line with the BoJ’s more conservative stance since the DPJ took office. Furthermore, the BoJ was likely encouraged by the USD/JPY’s recent solid performance above its important 90 threshold. However, yesterday’s larger than expected decline in both the Tokyo Core CPI and Household Spending tell us the BoJ can’t be too conservative with its monetary policy since deflationary pressures are still bearing down on consumer prices. Additionally, even though last week’s Industrial Production number printed better than analyst expectations, the 1.4% rate of growth is unsubstantial compared to the huge declines we witnessed during late 2008/early 2009. Hence, Japan’s economy still faces a long path to recovery. Meanwhile, investors will be focused on the flow of important U.S. econ data along with more Q3 earnings reports before Wednesday’s FOMC meeting. Additionally, investors will receive monetary policy decisions from both the ECB and BoE on Thursday. Therefore, we could be in for another volatile trading week since there is an air of uncertainty surrounding the upcoming central bank decisions. For the time being, it seems investors may favor the Yen over the Dollar as a safe haven due to yesterday’s selloff in conjunction with pullbacks in the EUR/USD, GBP/USD and AUD/USD. As a result, the USD/JPY could be in for further weakness should the S&P futures choose to test their October lows and the psychological 1000 level. However, we’ll also receive a public address from BOJ Governor Shirakawa on Tuesday along with BoJ meeting minutes on Wednesday. Any surprising language coming from either of these events could have a moderate impact on the Yen. Techncially speaking, the USD/JPY dropped through 10/16 lows and was fairly close to testing 10/14 lows. Furthermore, the currency pair sank past the highly psychological 90 level along with our 1st tier uptrend line on high volume. As a result, present momentum appears to be in favor of the downside. As for the topside, the USD/JPY faces multiple downtrend lines along with 10/30 highs. On a positive note, the currency pair has managed to climb back above 90 this morning to keep its head above water. Gold has recovered nicely from Friday’s slight pullback in the face of a stronger dollar and sliding equities. The precious metal has since plowed past the psychological $1050/oz level and our 1st tier downtrend line after U.S. ISM Manufacturing PMI and Pending Home Sales data points knocked aside analyst expectations. We recognize strength and stability in the EUR/USD and AUD/USD as well, gold’s stronger positive correlations. In fact, the EUR/USD and AUD/USD held up relatively well on Friday considering the extent of the selloff in U.S. equities. As a result of present activity, gold’s momentum has suddenly swung to the positive side. The final technical barrier separating the precious metal from a retest of previous 2009 highs seems to be our 2nd tier downtrend line hanging nearby. Therefore, although downward pressure does have a chance of kicking back in, technicals are suddenly working in favor of the topside once again. As for the downside, gold now has multiple uptrend lines serving as technical cushions and the psychological $1050/oz level is working the precious metal’s favor now. Meanwhile, investors should keep an eye on the EUR/USD and AUD/USD and monitor their ability to break through their respective Friday highs. Furthermore, investors should track the S&P’s present interaction with its own psychological 1050 level. It seems we should be in for another volatile week considering the amount of econ data we have to go along with Fed, BoE, and ECB monetary policy decisions. Therefore, investors should exercise caution and monitor the markets carefully since surprising news could shift sentiment rather quickly. The S&P futures are recovering nicely from Friday’s sizable retracement on large volume in the wake of rising investor uncertainty. The S&P futures slammed beneath Wednesday lows, yet managed to avoid a retest October lows by a narrow margin. Investors are testing the waters again this morning after the ISM Manufacturing PMI and Pending Home Sales data points came in well above analyst expectations. However, the ISM number isn’t too surprising since we’ve seen outperformance in regional Manufacturing PMI data recently. Exporters and manufacturing businesses likely benefited from October’s sizable depreciation of the Dollar. As for the Pending Home Sales number, while encouraging, the positive reading derives its strength predominantly from Existing Home Sales rather than New Home Sales. Hence, the problems that concerned investors on Friday haven’t been answered today. Therefore, a downward pressure does remain and investors may wait for more econ data and the monetary policy decisions later this week before making a larger commitment in either direction. Though U.S. data will be relatively quiet tomorrow, the markets should come to life on Wednesday with the release of ADP Non-Farm Employment Change and ISM Non-Manufacturing PMI data points. Not to mention the FOMC will announce its monetary policy decision later that afternoon, only to be followed by the BoE and ECB on Thursday. There is increasing investor uncertainty surrounding the present monetary stances of the aforementioned central banks. Global economic data has been printing mixed lately and there are signs that serious obstacles remain ahead of the economic recovery. However, before the data turned mixed the BoE was becoming more hawkish and the ECB dovish. Therefore, while investors are expecting the Fed to keep its policy unchanged, it will be interesting to see how the other two behave later this week. Meanwhile, the S&P futures are fighting to climb back above our 1st tier uptrend line and the psychological 1050 level. However, we’ve received some heavy sell-side activity lately, and the S&P futures also face our downtrend lines along with 10/29 and 10/27 highs. Therefore, some challenging immediate-term topside technicals are in play. As for the downside, the futures made a fairly negative statement by dropping beneath 10/29 lows on high volume. However, should the S&P futures deteriorate further they have October lows and the highly psychological 1000 area serving as technical cushions. Crude is strengthening from our 1st tier uptrend line after bottoming out above the psychological $75/bbl level. Crude futures managed to avoid any significant technical setbacks on Friday despite the substantial selloff in U.S. equities. Crude’s strength stemmed from relative stability in the EUR/USD and gold. Speaking of which, both are trying to set new bottoms of their own as we speak. Meanwhile, the S&P futures are bouncing nicely after ISM Manufacturing PMI and Pending Home Sales data points both printed much better than analyst expectations. The Manufacturing PMI is the more important number of the two since the ramp up in production ultimately implies an increase in demand for and consumption of crude. Today’s data negates Friday’s sluggish personal spending number, and crude futures are stabilizing as a result. However, despite crude’s present strength, the futures still need to deal with their psychological $80/oz zone, previous 2009 highs, and our downtrend lines. Therefore, crude does have some work cut out for it to the topside. As a result, crude may look for either the EUR/USD, U.S. equities, and/or gold to make the first move. As for the downside, crude futures have our 1st tier uptrend line, Friday lows, and the psychological $75/bbl level serving as technical cushions. Meanwhile, the EUR/USD is trading well off October highs and its psychological 1.50 level while the S&P futures are presently staring down their own psychological 1050 level. Therefore, topside headwinds remain with more important econ data on the way along with central bank meetings beginning with the Fed on Wednesday. Hence, while the technicals are beginning to work in crude’s favor again, there is more than enough fundamental and psychological news/data to send the markets in either direction. As a result, investors should remain alert and aware of the potential for high volatility.